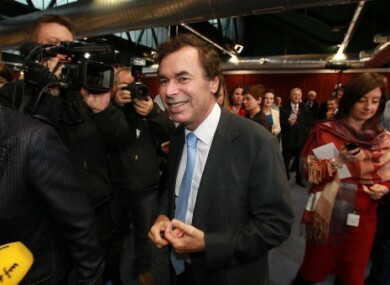 Alan Shatter at Dublin Castle yesterday. THE RESULTS OF the referendum to allow for the reduction of judicial salaries has been passed by over a million votes. The returning officer at the National Count Centre in Dublin Castle announced the results of the 29th Amendment (Judges’ Renumeration) a short time ago. The constituencies of Mayo and Wexford had the highest ‘Yes’ vote at 82% and 81.8% respectively. See Referendum.ie for the constituency-by-constituency breakdown. The passing of the judicial pay amendment was expected since earlier today when polls in regional centres indicated a ‘Yes’ vote was in the majority. However, the large number of spoiled votes – nearly 38,000 of them – will reinforce debate that the electorate were not satisfied with the clarity of the language used on ballot papers or explanations of what both referendums meant. However, Justice Minister Alan Shatter said this morning that the judicial pay referendum had a “far longer lead-in” time than the Oireachtas inquiries poll. He dismissed the criticism of eight former Attorney Generals on the pay issue as having “very little reasoning” behind it. I welcome the substantial public support for the Government’s proposal on judges’ pay. I was struck during the run up to the ballot by the appreciation that this proposal was fundamentally about fairness and ensuring that our judiciary were not perceived as immune from the financial difficulties affecting the state that have impacted on the pay of thousands of public servants. People were also anxious to ensure the continued protection of the independence of the judiciary and understood that the Constitutional Amendment that is now approved by the people would not in anyway undermine that crucial independence which is of vital importance to us all. Email “Referendum on judges' pay is passed with huge majority”. Feedback on “Referendum on judges' pay is passed with huge majority”.